With more heating appliances and equipment running to keep our homes comfortable and systems running smoothly during the cold winter months, the risk of a devastating house fire increases dramatically. When checking batteries in your smoke and carbon monoxide detectors, take an extra minute to be sure your fire extinguisher(s) is in working order. 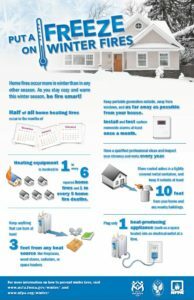 Whether you heat your home with a wood/pellet stove or oil/gas/propane furnace, a breakdown in safety equipment or poor user maintenance can lead to a fire. Make sure you routinely clean your chimney and properly dispose of ashes (metal can with lid, outside and away from the home). Have your system installed and inspected by a certified technician and use the proper fuel, and be sure to store additional wood and other combustible material at least 36 inches away from wood stoves. Do not plug space heaters into power strips and be sure heaters are on stable, level ground. The top cause of house fires in the United States is cooking. Colder weather brings us indoors to cook, and some of the best meals for the winter are slow-cooked – which means your stove and other appliances are plugged in and working for longer periods of time, even when you aren’t home (like a crock pot). Inspect all appliances for broken wires and other defective material, and make sure when they are plugged in, they have adequate clearance from potholders, kitchen towels, paper towels, cook books, etc. Never leave food cooking on a stove top unattended, especially if cooking with any kind of grease (if you do have a grease fire, do not attempt to put it out with water – cover it with a lid or use your fire extinguisher). Routinely clean your stove and oven to prevent drippings from catching fire the next time you use the appliance. Should you use your grill to cook outside in the winter, be sure it is located away from the house with proper ventilation for smoke and heat. If you smoke, consider smoking outside, but remember to properly dispose of your ashes. Do not simply flick them on the ground, which could be dry, and paired with a strong gust of wind, primed to start a major fire. If you place a can or other fire-safe container outside for butts and ashes, make sure it is located away from the house and deck and cannot be tipped over. Do not smoke in bed or when you’re tired – a lit cigarette dropped onto bed linens or furniture will ignite and spread rapidly with grave danger to the person who dropped it. Do not smoke around oxygen tanks or combustible material in garages and sheds. Winter means holidays, and holidays mean decorations – do not overload outlets or daisy-chain power strips, and do not leave decorations plugged in when you are not home or are asleep. Be sure to properly water your live Christmas tree, and do not decorate a live tree with candles. Do not place your Christmas tree (live or otherwise) near your heat source. Inspect all lights before putting them on your trees and homes, and be sure you are using the appropriate cord for indoor/outdoor use. Never leave candles burning unattended or where pets and children can knock them over. In addition, winter house fires are particularly challenging for first responders, who must also deal with the potential for frozen hose lines, dry and/or snow-covered hydrants, and ice buildup on the ground and equipment from water used to fight the fire. It may even be difficult for the fire department to navigate treacherous road conditions.